Hey you, it’s me! I mean it’s us. That’s right – I’m your future self at age 50. Can you believe it? Just for the record, we can totally pass for 48- so there’s that to look forward to. I just wanted to pop in and give you a little preview of your future life because I know this is a tough year for us and I want to help us get through it. Now I’m sure you have all sorts of questions about what we’ve accomplished and where we’ve ended up – like did we become a rock star? Are we married to Rick Springfield as planned? Well before I answer any of those questions there are a couple of things I want to show you. A convenient breakfast and $6.00 off a movie ticket! Who needs flying cars? First there’s this. That’s right, it’s a box of Eggo Waffles. Check it out; you can get $6.00 off a movie ticket through a special offer on this box of waffles! Crazy, right? What I really want you to know is that where I’m from $6.00 does not even begin to cover the full cost of a movie ticket. And if you want to buy the D-Box seats that shake and move to enhance your viewing experience, you’re looking at $20 a pop. I know that’s a lot to think about all by itself, but trust me, the D-Box experience is absolutely necessary just to get through the latest Star Wars films . . . Oh yeah, they are still making Star Wars films, but I can’t get into that right now. That’s a whole other visit . . . My point here is, we may want to rethink that English degree we end up with after failing out of the recording engineering program. Oh, and don’t feel bad about failing out the recording engineering program. Two words on that one: home studios. Anyway – maybe look into computer science and programming? Just a suggestion. It’s like having someone kick the back of your seat, but only when there’s fighting and stuff. No matter how our life has turned out, it’s not too late to waste the rest of it staring at one of these babies! Moving on – look at this. It’s a phone!! Seriously it’s my own personal phone. You know how right now our house has a phone number? Well in the future every single person has a phone number! And you just, like, carry it in your pocket wherever you go. Also . . . get this . . . you don’t actually use it to call anyone. And if it rings you ignore it – really that’s the best thing to do. Because no one you actually know wants to talk to you on the phone. Nope, it’s so much better than that – you just type little notes to each other. They’re called texts, but the word text is also a verb now – text, texting, texted. Don’t think too hard about it. But check it out – this phone is also a camera and a video recorder and a tape recorder! Now how much would you pay? Heh. That’s totally rhetorical; you can’t even imagine how much I paid for this. But, but . . . I can watch movies on it too! Seriously, real movies. Not here of course because cell service hasn’t even been invented yet. What do you think of that, huh? You’ll have one of these in the future. Cool, right? Oh yeah, the screen is cracked. It’s fine. Really, it’s fine. I can’t afford to get it fixed at the moment. . . So um – that whole rock star / Rick Springfield thing . . . I can tell you that you do move to California. We live near the ocean. It’s really cool and downright cold, occasionally. We’re in Northern California. It’s like 64 degrees and windy every day of the year. I think I’ve worn a bathing suit to the beach twice in the 20 years I’ve been here. Within driving distance and better than Wildwood, NJ! So Rick Springfield? Yeah, we meet him a couple of times, and his mom and his wife, too. Guess I just gave that answer away. But we never, ever give up on music despite our best judgment. And we play lots of live shows – so many. You will be so sick of lugging all that equipment everywhere, I mean I am most of the time, but we keep going . . . In fact you’ll be on stage at midnight the night you turn 50. It will just be a small club in San Francisco, but . . . the important thing is we never, ever give up on music. There’s a lot more – more than you can imagine, but I’ll let that stay a mystery. Can’t ruin everything, can I? But really, take some computer classes . . . and you’re totally gonna love this phone. And . . . I’m back. My last post was nearly 3 years ago. . . 2016: the year David Bowie died; the year DJT was elected president; the year I decided it was time to do something different with my life. The first two items from my very-cherry-picked list of 2016 events were terrible occurrences, but the third, deciding to doing something different with my life, was a good thing. I had been banging my head against a wall for at least a year trying to make something happen for my band, Shot in the Dark, and the universe just wasn’t buying it. It was a moment of reckoning between reality and every piece of advice you pick up as a child when they talk about following your dreams: if you really try, if you love it, if you really want it, it you work hard, it will happen for you. I want to say something snarky about how I must have been sick the day they added, “also, you should probably be young, attractive and have talent,” but I’m going to let it go. Yep, letting that go. So in 2016 I enrolled at the local community college in classes for early childhood education with an emphasis on special education. I enjoyed the classes and when the semester was over I applied for a job at a non-public school for students with moderate-to-severe disabilities. This was a huge step for me as I hadn’t been officially employed for almost 16 years. I got an interview and was offered the job on the spot. And what a job! This was a population of students I’d never worked with before despite all my years volunteering at my sons’ schools. Everything about the job was new and exciting and occasionally unpredictable. I felt I had found a place I belonged and could make a small difference in the world. And that was what has brought me here to January 2019, where I am now in a credentialed master’s program for special education while working part time at a school district. And I’m feeling less certain about having found my place. As if on cue, Music, like a long absent ex, shows back up on my doorstep asking to just hang out for a bit, you know just to catch up. And so here I am with more music, hoping 2019 can be a year of balance and happiness for me personally. I can’t comment on what’s going down with the rest of the world. Before my break I was all about synthesizers and drum machines and production. Now I’m concentrating more on an acoustic sound and live performance. Check out the video and let me know what you think! Summer is now almost over, at least as far as my children are concerned. My oldest begins 10th grade on Monday, August 17th, while my youngest will be stuck hanging around the house with me until August, 26th. I am loath to use the word “epic”, but epic is the only way to describe my summer. From a really fabulous show at Winter’s Tavern with Debora Iyall and Girls with Guns, to a month-long vacation in Europe, it’s really been a once in a life time kind of summer and I feel so amazingly grateful and blessed to have experience it. In which my family and I take a trip through Europe, Hunter Something requests a great deal of sweets, and Fat Daddy seeks out only the best. There were the four of us then: Zed, Fat Daddy, myself and Hunter Something, Hunter S. for short. Hunter S. was a complete snack-head at the time, couldn’t go more than a few hours without a hit, even though we kept trying to get him to take to regular meals. It was the sugar. He’d go completely bonkers for it. We tried to keep the whole thing under wraps. No meat, dairy, or any opened foods when crossing borders, but the tour bus rides were long and we learned to put the choco granola bars at the bottom of our bags just to get past customs. Fat Daddy was useful for keeping him in check too; he was good at playing the heavy, so to speak. Fat Daddy had his own taste in sweets, much more refined than any of ours at the time. He was used to the creme de la creme of dessert and wasn’t settling for the likes of what you get off of your typical food trolley. Of course we made it through London just fine with the sticky toffee and Amsterdam with its stroopwafel worked out quite well. But we got a bad batch of marzipan in Estonia and that took a couple of days to shake off . 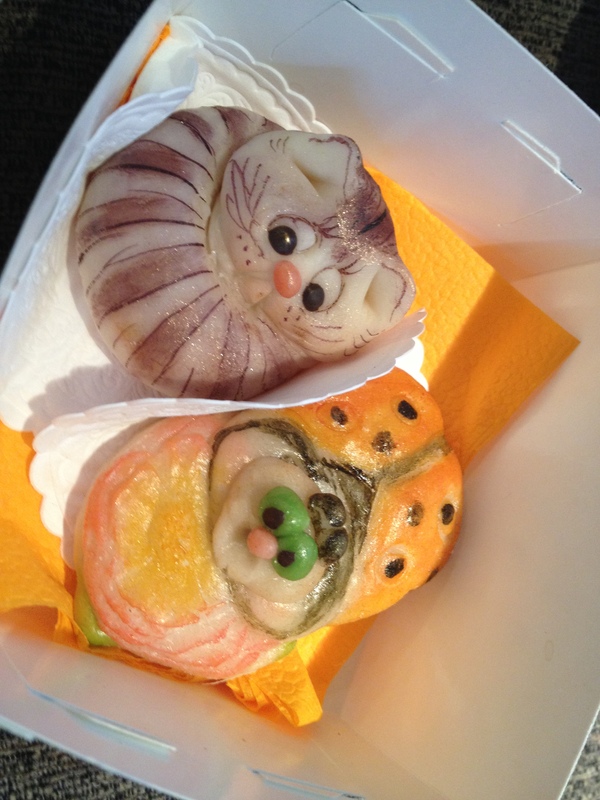 . .
Estonian marzipan – purely decorative. Enjoy the rest of your summer. I leave you with a couple of videos of my band at Winter’s Tavern. A Movie, Some Music . . . 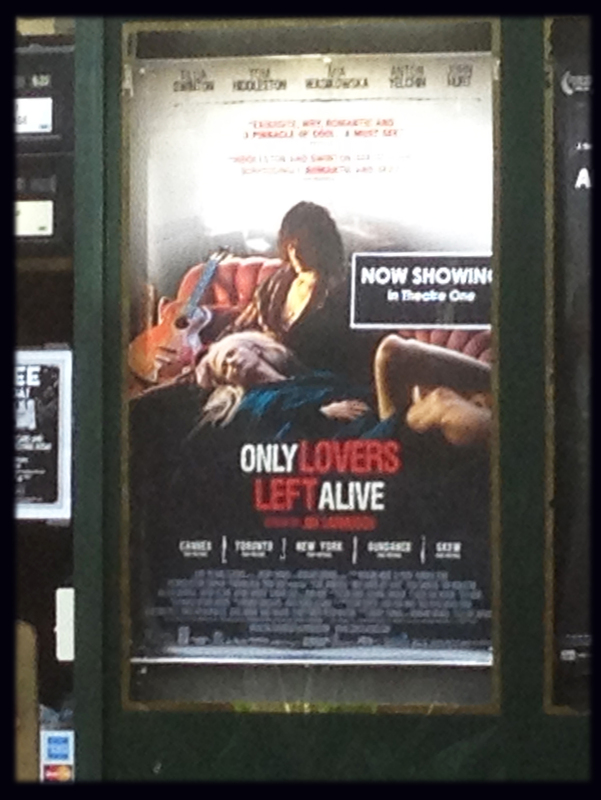 I spent Saturday afternoon at The Opera Plaza Cinema watching Only Lovers Left Alive, exactly where I had wanted to see the movie when I first heard about it. While the film does have a very 90’s feel – Jarmusch, vampires, Tilda Swinton, a soundtrack of moody, heavy guitar, it did not allow me to time warp back to 1995 as I had hoped: Indie Movie Time Machine. You can travel back in time, but only while the movie is playing. No, I didn’t get that experience. Instead I felt anchored to my present reality, one in which I’m rather busy with my family and new music and the slightest attempt at starting my own business. It’s nice to be so connected to my current life, but I do enjoy getting lost in a good movie and I’m afraid this one just wasn’t powerful enough to make that happen. When it was over, my fellow film goers agreed it was visually beautiful, but slow-paced, with moments of dry humor. It seemed to me that seventy percent of the main characters’ dialogue consisted of historical and scientific facts, a constant reminder of the ages and information the vampires had witnessed and absorbed in their long lives. “Do you think it was written that way out of sarcasm or irony?” asked one of the women in our group. “I mean they were such snobs. Was he making a point about snobbery?” I’ll go with that. Perhaps the point is that the thinking-man’s vampire will become turgid, not with blood but knowledge that, while impressive, can become just as much a crutch as violence or melodrama when used so extensively. Or perhaps I’m the real snob here. . . But then, Tom Hiddleston. Meanwhile, back in my everyday life, I’m excited to be part of KnightressM1’s upcoming show at the Milk Bar in San Francisco on June 5th. Violinist/vocalist Emily Palen is the creative force behind KnightressM1, and she is one of those rare people with a direct connection to the music god(dess). I first saw and heard Emily at The Red Devil Lounge with the band, Dolorata and she has since gone on to play and record with many groups in the Bay Area as well as the Foo Fighters. The music I’m helping her bring to the stage is more electronica influenced than the music she regularly performs with her power trio. It’s beautiful and compelling and I was immediately drawn to it. It’s also subtly complex and nuanced. It is definitely challenging me in regards to knowledge of my gear, Ableton Live, as well as my musicianship. Here’s a song we will be performing on June 5th. Enjoy!